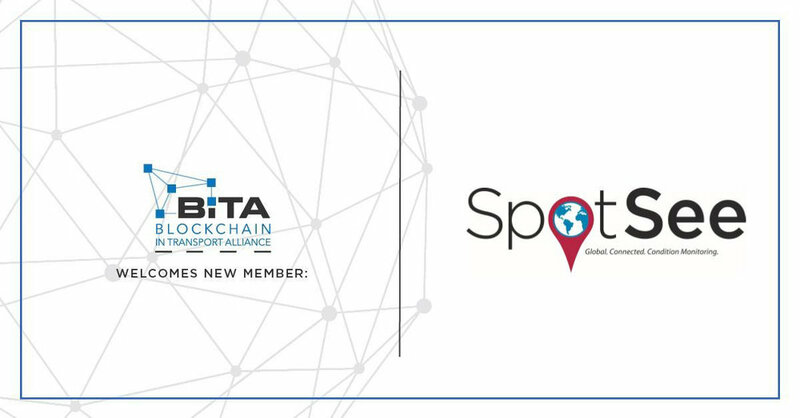 SpotSee, the global leader in shock and vibration monitoring through low-cost connectivity and data, is joining the Blockchain in Transport Alliance (BiTA) to help develop the standards for blockchain in the transportation market. While supply chains are highly complex global environments within the transportation industry, blockchain can help mitigate many common issues that companies are currently facing. BiTA aims to create standards and educate logistics companies to unlock the full potential of blockchain within the industry. As a company that focuses on supply-chain transparency and connecting customers with their assets, SpotSee is familiar with the potential benefits blockchain technology could bring to the table. Blockchain is a secure and transparent technology that does not require a central authority, but instead, relies on a consensus for authorization. Originally developed for cryptocurrencies, blockchain has expanded into many different industries due to its secure and unalterable record-keeping. Using blockchain, the supply chain will see a decrease in asset handling issues and fraud while reliably tracking assets throughout their journey by creating a permanent and unalterable record as registered vendors and third parties handle assets. SpotSee helps customers know the condition of assets as they travel throughout global supply chains, enabling smart contracts to immediately reject shipments (and payments) on assets that may have seen excessive damage. Established in 2017 by experienced tech and transportation executives, BiTA was created as a forum for the development and education of blockchain standards within the freight market. The company’s goal is to bring together leading companies in the industry that have a vested interest in the development and standardization of blockchain technology. SpotSee is an internet of things end-to-end solution provider that enables customers to spot damage in their operations and see it in real time. SpotSee has developed a low-cost, connected, ecosystem that includes its own mobile virtual network enabler (MVNE) that delivers data from devices anywhere in the world to customers’ fingertips. SpotSee devices monitor shock, vibration, temperature and other environmental conditions through its market-leading brands such as ShockWatch®, ShockLog®, SpotBot™, OpsWatch and WarmMark®. The company has a global network of over 300 sales and technical service partners in 62 countries. SpotSee is headquartered in Dallas, Texas, with operations in Brazil, Netherlands, United Kingdom, China, Mexico and Graham, Texas. For more information, visit www.spotsee.io. Founded in August of 2017, BiTA promotes the development and adoption of blockchain applications in the trucking, transportation and logistics industries, including establishing industry-wide standards. Members include truckload, LTL, and parcel carriers, as well as shippers, tech startups and incumbents, insurance companies, law firms, and other industry participants who have an interest in integrating blockchain technology into their organizations. Visit BiTA at https://bita.studio/.